At home, before we eat, we all take hands and say “Thank you for the food.” The speaking of the words usually falls to the munchkin, who delights in adding variations: “Thank you to Mommy/Mama for this wonderful dinner,” “Thank you for the shrimp and the noodles and the carrots,” and the like. When we got to Mexico Joy and I proposed saying it in Spanish as well every time. Munchkin responded by adding a third language, one in which she is fluent, and after she’s informed us as to which one will be said by whom, the family meal now begins something like this. Joy: Thank you for the food! Me: ¡Gracias por la comida! In such ways do we make rituals our own. 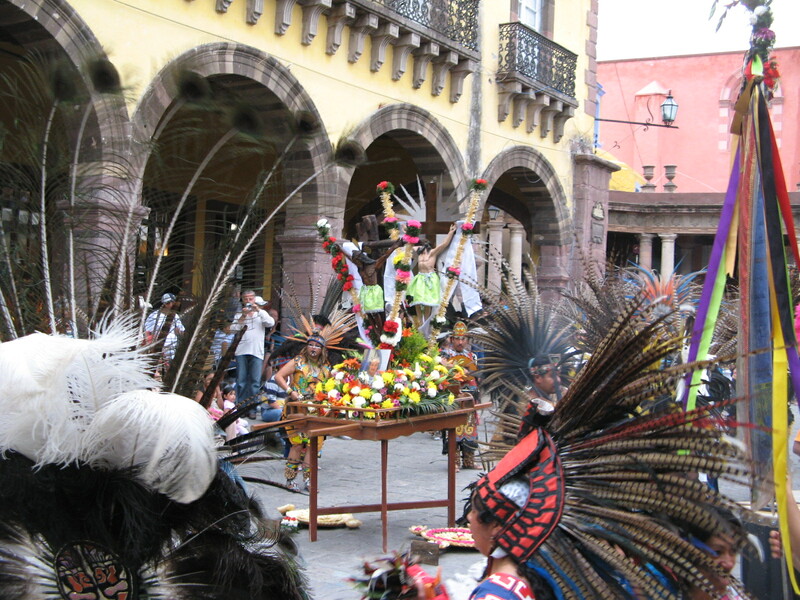 Speaking of which, we went to a fabulous fiesta Friday night, where the image of Jesus “Señor de la conquista” is carried out of the Parroquia (parish church) amid fireworks, dancing, and drumming. 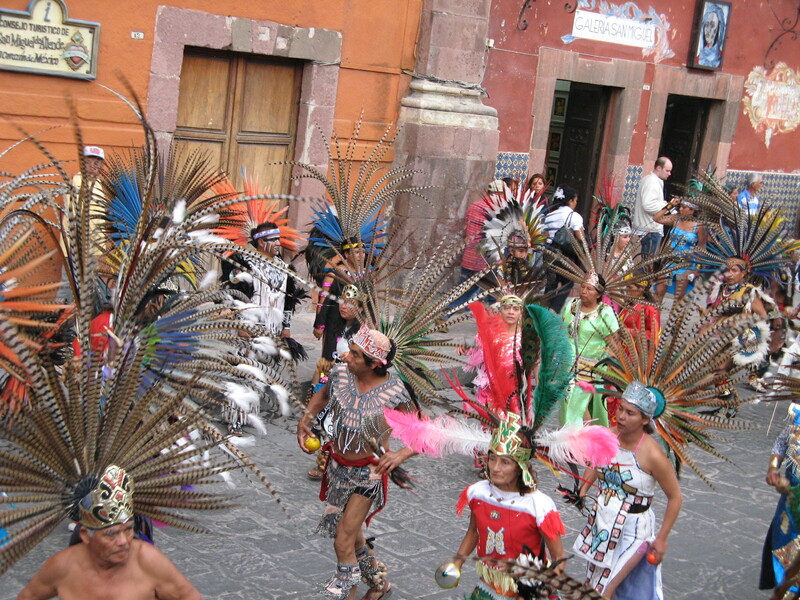 The article in the local paper says the fiesta is held “porque el catolicismo conquistó a los indios,” but, while I’m not dismissing the real, frequently devastating impact of Catholicism on native religion, the overall impression I got from the festival is that los indios and their pre-Catholic religious practices are going strong. 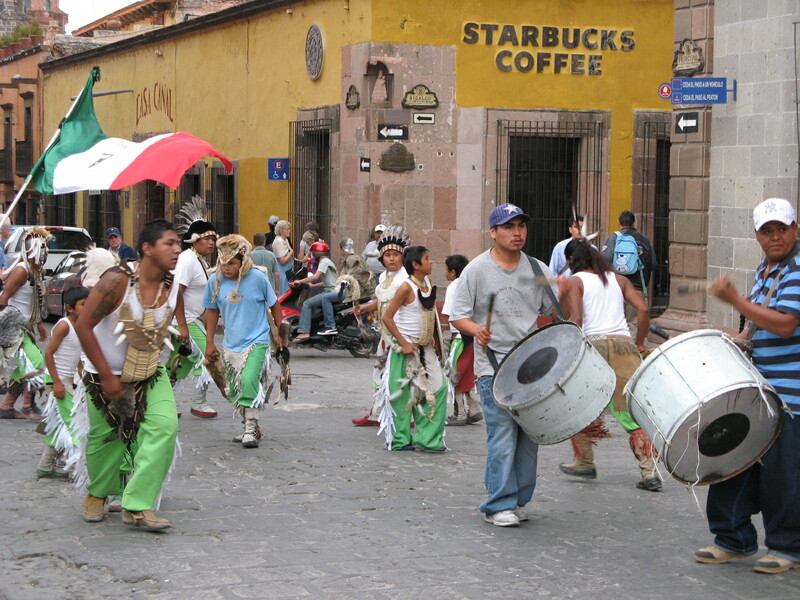 People of all genders and ages danced and drummed. 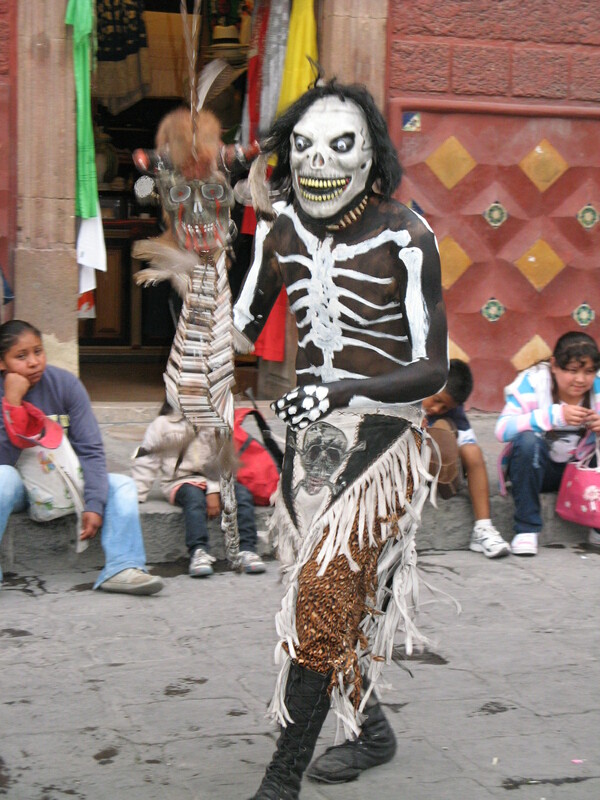 The munchkin declared this guy “scary” but loved the whole event. We thought she’d want to watch for a few minutes and then eat dinner; an hour later she was still mesmerized. The good old Catholic church. 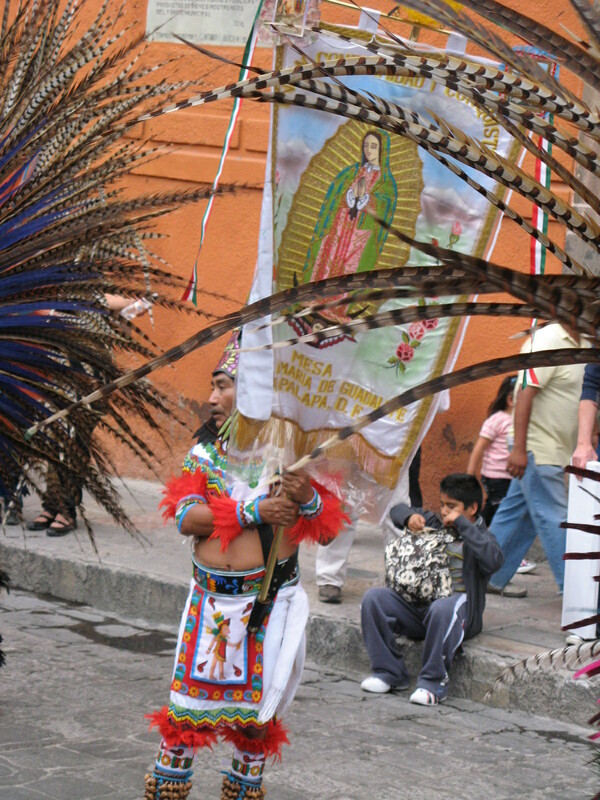 “Fine, keep your feathers and your drums and your heathen dances, as long as you add Jesus into the mix.” (Mexican national pride is part of the mix too, as you can see from the dancers carrying the flag.) I’m betting this relaxed attitude toward syncretism is a more successful way to spread the word than uptightly insisting that indigenous people wear trousers and sing Wesley’s hymns–in short, imposing European cultural forms that are not inextricable from the religious concepts. I make this assertion knowing almost nothing about missionary history. However, I think it’s a point to ponder for people concerned about church growth and diversity. What would Unitarian Universalism look like if we (meaning those who currently “own” it, a term I use ironically) relaxed a little more about the forms it takes on as it comes to different cultures (or subcultures) than the white, English-speaking, Calvinist-descended people among whom it largely originated? I don’t want us to conquer the natives, but I would like everyone who feels the call of Unitarian Universalism to be able to respond, and meet with a warm welcome instead of skeptical looks from those who are at home with the Protestant worship structure and European classical music that dominate today. It will look different in other hands. They will change it for themselves and, in some part, for everyone. If that means dancing like we saw Friday night, it sounds like a win-win to me.